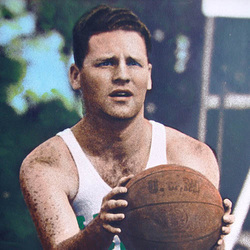 John "Red" Tobin was one of the stellar athletes during the formative years of the University of Miami's sports history. It was during his era that the Hurricanes started playing "Big Time" football teams such as Georgia, Florida, South Carolina, etc. under legendary Coach Jack Harding. Red excelled at the wingback position out of the single wing system. During this era, players played both offense and defense. Red also excelled as a defensive halfback. The Hurricanes went 8-2 his senior year in 1941 with 5 shutouts. Basketball was Tobin's natural game. He was a exceptional set-shooter, as well as being captain of the 1941-42 team, when he averaged 13.8 points per game. He lead the team in scoring all three seasons, the first Miami player to do so, scoring a career total of 586 points for a 11.3 career average. Back before 3 point shots and a shot clock made college basketball a high scoring affair, his total was nearly 35 % of the teams scoring. Being an all-around athlete, he lettered in baseball, too, as a pitcher.